The synergism between two developing agents, also known as superadditivity, is often illustrated graphically by a curve with a defmite peak showing some kind of optimum ratio of one agent to the other. This peak can be misleading because it shows how developer activity changes as one agent increases while the other decreases. We really should examine the change of activity due to change of one of the agents while the other is held constant. In phenidone-ascorbate developers I have used 40 parts by weight of ascorbic acid to one of phenidone as the ratio that gives the minimum phenidone to activate a given weight of ascorbic acid. I arrived at that number by noting that the usually quoted optimum ratio of Metol to hydroquinone is 1:4, and that when substituting phenidone for Metol, one should use 1/10 as much phenidone as Metol. That is not a very scientific approach to the problem. I have been using ascorbic acid to replace hydroquinone under the unwarranted assumption that they are photographically equivalent. It is about time that I did some experiments to find out if that ratio does give the maximum activity for the phenidone-ascorbic acid pair. I wish also to determine if using a ratio greater than that of maximum activity might have some advantage. My normal developer these days has, in each liter of working solution, 2 grams of ascorbic acid and 0.05 grams of phenidone, with which I use a variety of alkaline solutions as activator. For these experiments I have chosen to use sodium metaborate 4 mol. For details of this compound see https://www.borax.com. I use 20 ml of a 30% solution of the metaborate to make 1 liter of working solution. This formula gives a normal developing time at 70' F of about 7 minutes for HP5+ film. In order to determnine the effect of variation of ascorbic acid content, I began with a solution as described but containing only 1 gram of ascorbic acid per liter. I used 250 ml of solution to develop each of four test strips, doubling the effective amount of ascorbic acid for each successive test. Thus my tests had 1, 2, 4, and 8 grams of ascorbic acid per liter while phenidone remained constant at 0.05 grams per liter. In order to avoid as much as possible changing pH along with the change in amount of ascorbic acid, I made 100 ml of a solution containing 10 grams of ascorbic acid and 4.77 grams of sodium bicarbonate. I dissolved the ascorbic acid and bicarbonate in a small amount of water and allowed the effervescence to subside before bringing the volume up to 100 ml. Ten ml of this solution contained the equivalent of 1 gram of ascorbic acid, but with a pH very close to neutral. I contrived a means of using a 35 mm camera body as a contact fratne for exposing a Stouffer TP 35 21 step density wedge with 21 increments of 0.15. 1 used the camera's shutter and the enlarger lens to get 36 identically exposed density test strips on a single roll. I developed a short piece of this roll in each solution and read the resulting densities with an easel densitometer. I used a single reel stainless steel developing tank and agitated by inversion 5 seconds each minute. The H&D graphs I got from these tests are shown in Figure 1. Each step along the horizontal axis is a change in log relative exposure of 0.15, or ½ F-stop. Straight lines of best fit as calculated by my spread sheet program are superimposed over the range I used to calculate them. The slopes of these lines are representative of the contrast indices but are free of any personal bias I might have added if I had drawn them by eye. 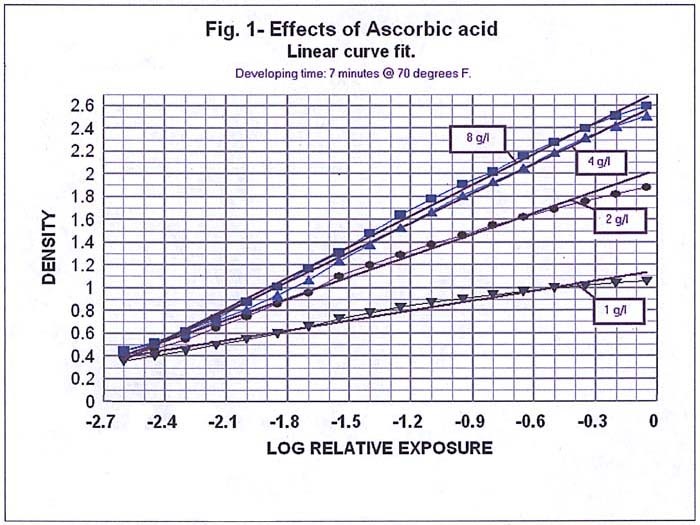 These contrast indices are plotted in Figure 2 against ascorbic acid concentration in grams per liter of developer. Here it is evident that doubling the concentration of ascorbic acid from two grains per liter to 4 does not double the activity of the developer. Remember that the phenidone concentration remains constant as does pH. Two grams per liter corresponds to a ratio of 40 to 1 ascorbic acid to phenidone. Doubling the amount to 4 grams per liter produced only about 25% increase in activity. From 4 to 8 grams per liter there is a negligible change in activity. Neither is there a peak within the range tested, but what appears to be an asymptotic approach to some limiting value. Considering only initial activity, one might conclude that not much is to be gained by increasing the amount of ascorbic acid above the 40:1 ratio. If we look at the result of losing a portion of the ascorbic acid through use or through oxidation, then we see that the loss of one gram will cause about 50% loss of activity from the 40:1 ratio, but only about 15% loss from the 80:1 ratio, and a loss of 4 grams from the 160:1 solution causes a. loss of acitvity of only about 3%. How much film can a gram of ascorbic acid develop? A rough analysis of what that means in practical use is as follows. Each mole of ascorbic acid can reduce two moles of silver bromide to two moles of silver and 2 moles of hydrobromic acid, forining 1 mole of dehydroascorbic acid in the process. Thus one gram of ascorbic acid can produce 1.28 grams of silver. According to a relationship established by Hurter and Driffield1, each density unit requires about 0.00012 grains per square centimeter on conventional films. Somewhat less is required on modem tabular grain films. One 8 X 10 inch sheet developed to average density of one contains on the order of 0.06 grams of silver. 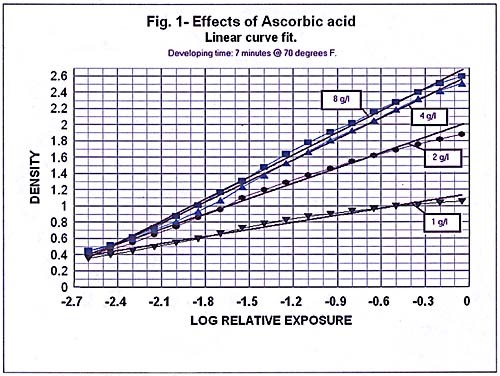 Therefore, 1 gram of ascorbic acid can reduce 20 or so 8 X 10 sheets of film to an average density of 1. If I develop two rolls of film, and my developer contains only 1 gram of ascorbic acid to begin with, 0.9 grams would remain at the end if reduction of silver halide were the only cause of loss. Exhaustion of the developing agents due to reduction of silver halide is thus not a serious consideration even at 1 gram of ascorbic acid per liter. The formation of soluble halides, aerial oxidation and the decrease in pH are of more concern. How much oxygen is worth a roll of film? Ascorbic acid and its isomers are known to be efficient antioxidants. Oxygen, chlorine and other elements dissolved in the developer or entrained in the solutes will oxidize ascorbic acid even in acidic solution. Aerial oxidation also causes formation of dehydroascorbic acid. One gram atomic weight of oxygen, 16 grams, will oxidize one gram molecular weight, 176 grams, of ascorbic acid. The products of aerial oxidation are water and dehydroascorbic acid. As little as 0.09 grams will oxidize 1 gram of ascorbic acid, the same amount that will develop about 20 rolls of film. There is nothing in any ordinary developer that will reduce dehydroascorbic acid to ascorbic acid. Looking at it from the other side, 0.0045 grams of oxygen is worth about one roll of film. Whatever oxygen is in the water or entrained in the solids used to make the working solution disables a certain amount of ascorbic acid. The same is true of elemental chlorine. Do not use chlorinated water to mix ascorbate developers. In this case one molecule of chlorine and one of ascorbic acid combine to form two molecules of hydrochloric acid and one of dehydroascorbic acid. These reactions will occur even in acidic solutions, and sodium sulfite is little or no protection for the ascorbate, because the ascorbate is a more powerful antioxidant than the sulfite. It protects the sulfite. The general tendency of ascorbate developers is to become more acidic as a result of normal use, chlorination or aerial oxidation. Oxygen reduces pH less than chlorine and fluorine. Oxygen produces only water and dehydroascorbic acid, while the halogens produce the corresponding acid as well as the dehydroascorbic acid. This reduction of pH reduces activity. The good news is that pH is measurable and correctable, while loss of ascorbic acid is not easily detectable except by ruining some film. In a split stock formulation where phenidone and ascorbic acid are kept in one of the solutions the aerial oxidation of this solution can still take place, but the change in pH of this solution due to the formation of dehydroascorbic acid will be small, especially if chlorinated and fluorinated water are avoided. In this case, when there is a considerable excess of ascorbic acid above the amount that can be activated by the phenidone in solution, the amount of the alkaline activator solution required to give a certain pH in the working solution will not be appreciably different whether it is neutralizing ascorbic acid or dehydroascorbic acid. 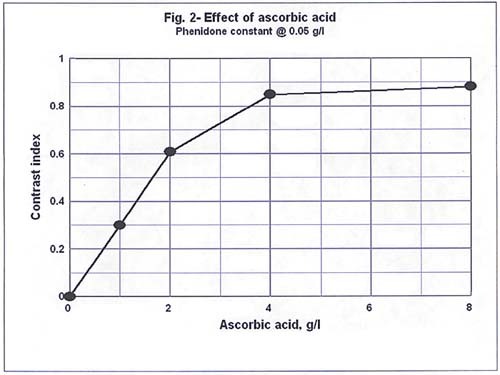 Until the ratio of ascorbic acid to phenidone goes below 40 to 1, there should be no noticeable change of initial activity of the working solution. Phenidone is often described as the primary agent in developers like the one tested here. The secondary agent is said to regenerate oxidized phenidone to its original state. In fact, the ascorbic acid is a scavenger of anything that might be, at least in old-fashioned terms, a free radical. Oxygen in water solution is such, as is chlorine used as disinfectant. Halogen atoms set free from silver halides by photolysis or by phenidone are taken by ascorbate and converted to hydrobromic acid and dehydroascorbic acid. Phenidone is not lost in this process, but ascorbate is. The experiments presented here have shown that adding ascorbate to a phenidone-ascorbate developer above the amount that can be activated by the phenidone content will cause little change in developer activity. The excess serves as a preservative and as a reserve. 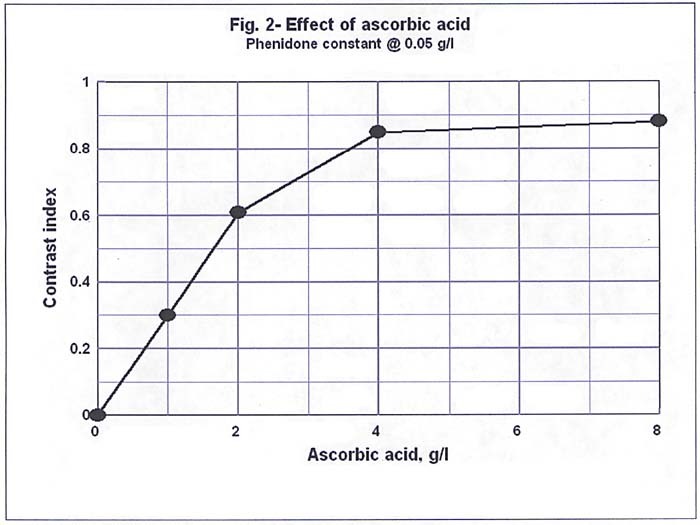 A split stock formula in pure water containing only phenidone and ascorbic acid, with the initial ratio of ascorbic acid to phenidone at 80:1 or higher, should have a long storage life and constant activity. The ratio of alkaline activator solution to developing agent solution required for a given initial activity of working solution should remain constant for the life of the solutions. 1. The Photographic Researches of Ferdinan Hurter and Vero C. Driffield; Edited by W.B. Ferguson; The Royal Photographic Society of Great Britain.